﻿Double-click ﻿the ﻿.dmg ﻿download ﻿to ﻿open ﻿the ﻿disk ﻿image. ﻿To ﻿install, ﻿first ﻿drag ﻿over ﻿the ﻿framework ﻿icon ﻿then ﻿drag ﻿over ﻿the ﻿application. 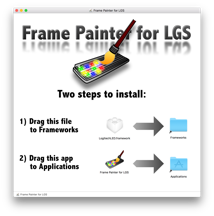 ﻿The ﻿first ﻿time ﻿you ﻿open ﻿Frame ﻿Painter ﻿for ﻿LGS ﻿you ﻿may ﻿have ﻿to ﻿right-click ﻿on ﻿the ﻿application ﻿icon ﻿and ﻿select ﻿“open” ﻿to ﻿satisfy ﻿macOS’s ﻿default ﻿security ﻿settings. ﻿You ﻿won’t ﻿be ﻿bothered ﻿again. Extract the folder from the zip file. Inside the folder, open Frame Painter for LGS.exe. You can create a shortcut or pin it to your start/taskbar to make finding it easier. The first time you try to open the app, you may have to click the “More Info” link in the Windows warning message and then click on “Open Anyway” to satisfy Window’s default security settings. You won’t be bothered again.